Call Of Duty 4: Modern Warfare has one of the easiest menu systems to navigate to date. "Multiplayer" is right on the main menu, followed by "Single-Card Play": it doesn't get any simpler for that. Every new user should pick it up instantly. Download time is quick, and seems even quicker with sevweral extra buttonm pressing steps throughout the process. Also, the opening credits are skipable. The options in the menu are clearly labeled. The labels make sense. They're big enough to tap and take up so much space, buffer space is unnecessary. 'Nuff said. Call Of Duty 4: Modern Warfare is extremely intuitive. In under a minute, I'd learned every aspect of its control scheme, short of controlling the zoom and understanding the difference between computers. In truth, the computers are an optional part of the experience. The biggest problem I had with the controls was zooming. How shall I put this... the sensitivity of the zoom function is, well, broken. Zooming works by double-tapping the lower screen. The problem is that doing your looking around (touch-screen based) can sometimes trigger your ability to zoom. While yes, there is a difference in the way the gun looks to indicate you're zoomed in, I just thought I'd picked up a different gun. Overall, it's not a crippling problem once you're used to what zoomed out looks like vs what zoomed in looks like, it's just annoying. The game has what is a very impressive look not just as an overall game for the Nintendo DS, but it's look is alse impressive for downloaded content. Some games (Over The Hedge comes to mind) will have a terrific look in the main game and then cheap out with really crappy 2D doenload graphics, but not Call Of Duty 4: Modern Warfare. The sound is limited to sound effects (background music in this type of multiplayer for this type of game wouldn't make sense) and they're wholly unnecessary as you hear only your own footsteps and not those of an opponent around a corner. There are no selectable features beside the two choices of locations. Call Of Duty 4: Modern Warfare has a shallow, but impressive, deathmatch mode. I say shallow, not because it can't keep you entertained by long-lasting play and not because it's full of itself (the 3D is rather impressive), but because there isn't a great depth of options (just two stages). LEGO Star Wars II: The Original Trilogy had several character options (for the host) and two minigame options instead of Call Of Duty 4: Modern Warfare's one. Metroid Prime Hunters had just the one mode, but tons of power-ups and multiples character options and stage choices. Don't get me wrong, I like the multiplayer deathmatch here, I really do, but it could have provided more. I'm looking forward to a sequel (spinoff or Call Of Duty 5) and an enthralling, deep, option-laden multiplayer deathmatch offering, and I'll be right there in the trenches... buying the game. Allow for more stage selections. Offer difficulty settings (more/less bullets, grenades, items, etc.) in the deathmatches. Let players to hear opponents coming from around corners! Permit players to select the end game conditions. 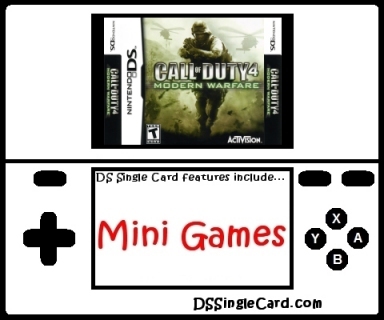 Click here to return to the DSSingleCard.com Call Of Duty 4: Modern Warfare profile.